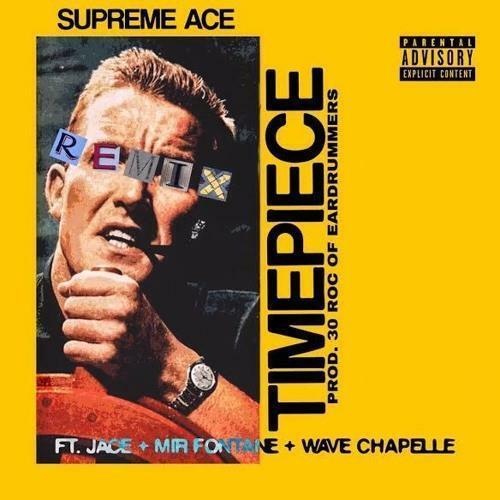 After a strong collaboration with Michael Christmas on "Make A Play," Supreme Ace blesses us with another track, this time with a (remix) to "Timepiece." The track features Jace of Two-9, Mir Fontane, and Wave Chapelle. Produced by 30 Roc of Eardrummers, the song features that bouncy cadence that's taking over rap. The beat also has a bell loop that really makes the track a good listen. Supreme Ace announced that his Trill Influence 2 project will drop sometime this year. That's not the only thing Ace Supreme has cooking up, he has also been teasing his Layovers In NYC project, expect to hear more about both projects soon.